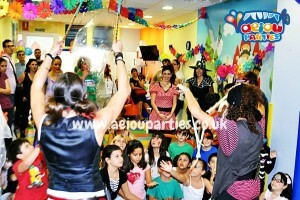 The best Kids party Entertainment in London! *Greater London includes all boroughs in North, South, East and West London: Central London, City of Westminster, Kensington and Chelsea, Hammersmith and Fulham, Wandsworth, Lambeth, Southwark, Tower Hamlets, Hackney, Islington, Camden, Brent, Ealing, Hounslow, Richmond upon Thames, Kingston upon Thames, Merton, Sutton, Croydon, Bromley, Lewisham, Greenwich, Bexley, Havering, Barking and Dagenham, Redbridge, Newham, Waltham Forest, Haringey, Enfield, Barnet, Harrow, Hillingdon. AEIOU children’s and kids party entertainment in London inspire the kids’ imagination through a wide range of dynamic children’s party activities ranging from magic, balloon modellers, and face painting to the good old-fashioned party games and just plain clowning around. We offer children’s events in London and entertainment with extremely competitive prices while providing top quality party entertainment. As experienced children’s party entertainment and party organisers we are 100% flexible and can help you plan your party as needed. First class children’s parties in London at great rates with no hassle. We even have Santa Claus for hire in London. All our entertainers are CRB – DBS Checked staff and we place children’s health and safety first and foremost. Priding ourselves on providing first-class childrens party entertainers in London, we believe safety first and fantastic fun follows! Our philosophy consists of organizing children’s parties with fun, dynamic activities that promote participation to ensure that the children, not the entertainers, are the stars of the show! We never want to overshadow the kids on their special day. The entertainer will energize the group, leading them through an exciting series of activities to create a special, fun and unforgettable day. What sets us apart is our professionalism and the fact that we take the job of making your child laugh very seriously. Yes, the parties are filled with antics, jokes and humor, but everything has been prepared based on your requests to be sure that the party is a complete success. We always conduct our business with serious professionalism and you should feel free to call us or send us an email at any time. We are just as serious as we are fun in the parties without putting a hole in your wallet. They know how to win over the children, even the shyest guests! We offer a large variety of costumes that you can choose from for the entertainers: magicians, pirates, princesses, fairies, Prince Charming, Little Red Riding Hood, Mickey, Minnie, clowns and all of the accessories. 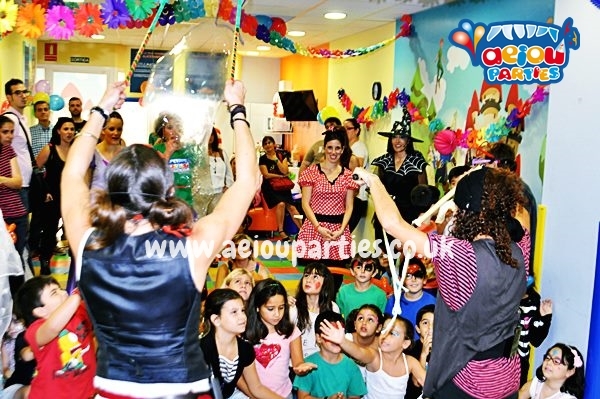 Celebrate all kinds of kids parties with AEIOU Entertainment! We also offer fun-for-all amusement to schools, nurseries, playgrounds and community groups. Just ask the Queen, why celebrate only once a year when there are 364 more days to enjoy! Looking for some kids fun but not a kid anymore? End of the year bash? Special corporate anniversary? 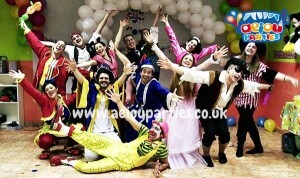 AEIOU kids club party entertainers in London can also help organise and plan your company or personal party. Contact us for more information. 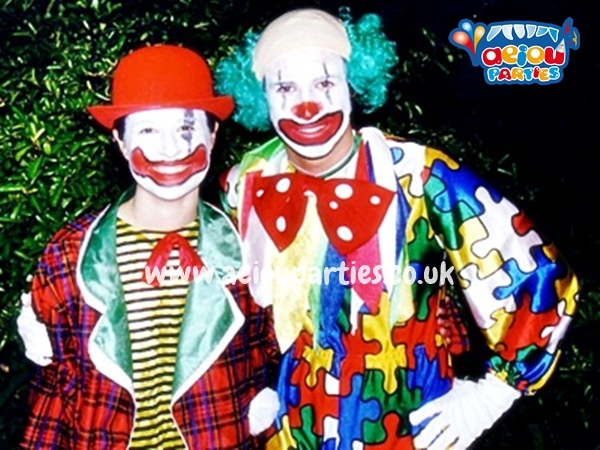 Overall, our Children’s party entertainment in London has the aim of bringing joy and that special something to any kids birthday party. In order to achieve that, we are always looking for new stuff, new activities, games, having the most modern music hits and adapting to what kids like nowadays. That is why we are always open to adapt to your needs and we have started our unique themed parties, based on your demands! 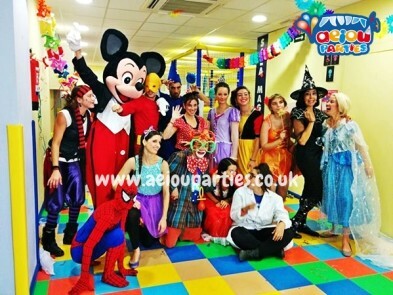 Our children’s party entertainers in London are now able to do our magical Harry Potter Themed parties, amazing Frozen parties for kids, Scary Halloween parties and seasonal Christmas parties, we have recently added to our repertoire the Mad Hatter and Alice in Wonderland parties as well as Star Wars themed parties for kids. Yo name it, we do it. The most important thing for us is to make it unique and special. Hire our Magicians, clowns, pirates, wizards, superheroes, fairies, princesses, puppeteers, bubblologists, scientists, dancers, monitors and hosts online, by the phone and immediately. Everyone will have a good time, especially the birthday girl / boy, and you are going to call us every year to come back with our children’s party entertainers in London. 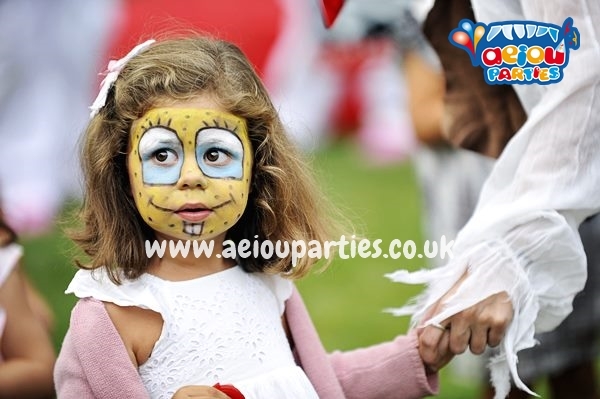 AEIOU Kids Club, bringing new ideas and delivering the best parties in London and the UK.